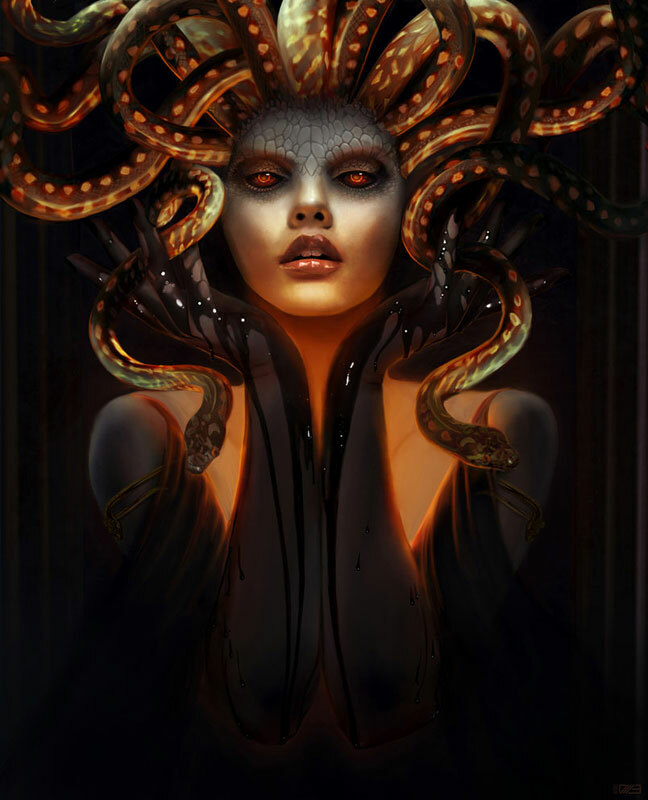 Medusa – Gorgon is one of the oldest and most popular ancient myths. 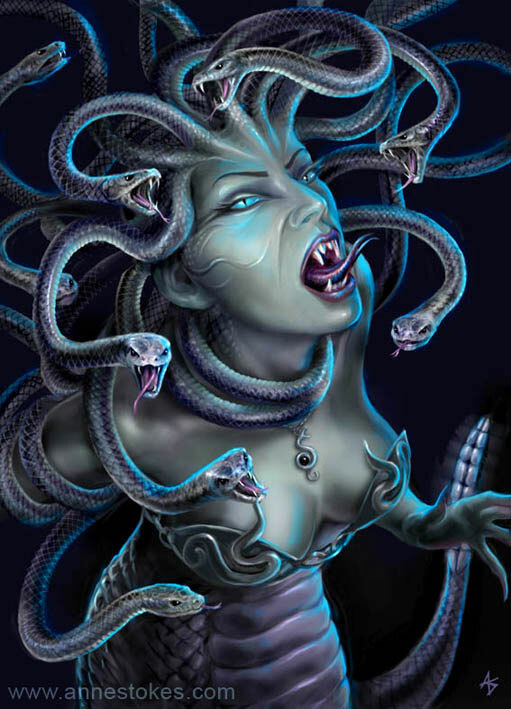 Medusa in Greek mythology is referenced as one of the three Gorgons. Of these three sisters, Medusa was the mortal one. 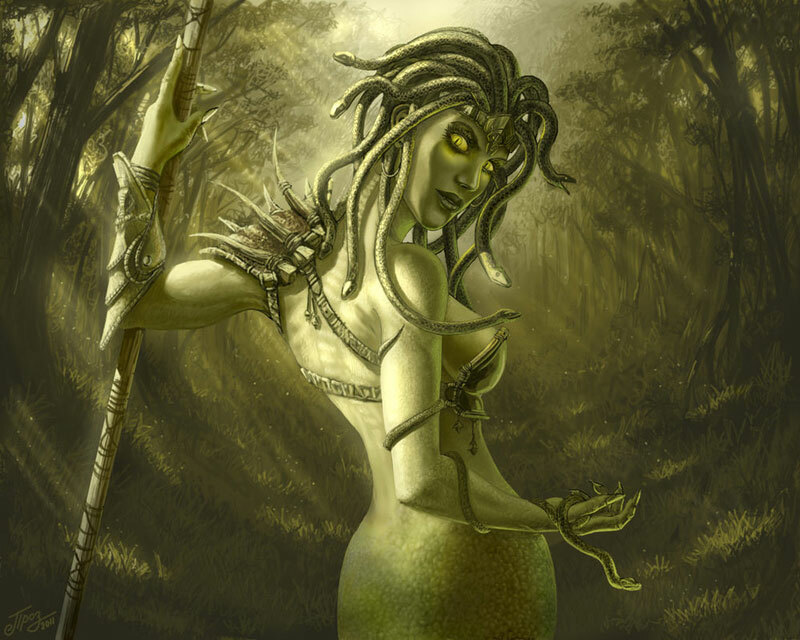 Her other name was Gorgon, meaning "tough glance". 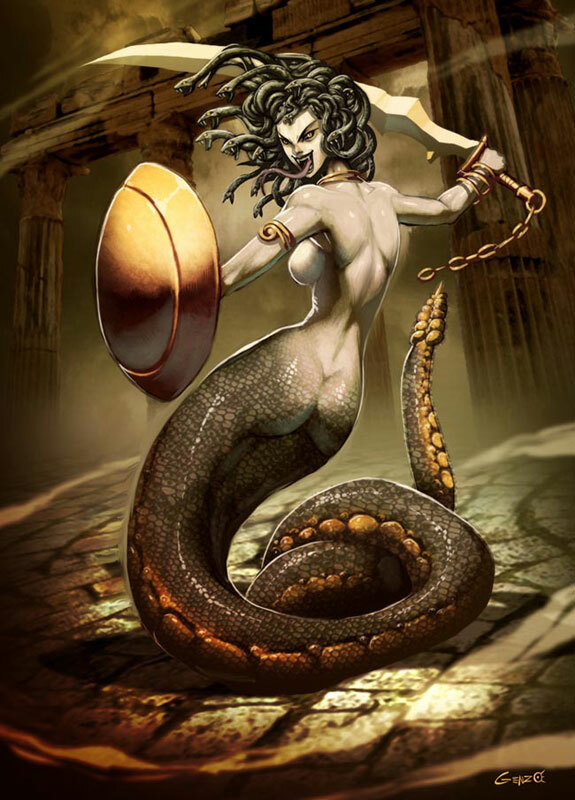 Daughter or the ancient marine deities Phorcys and Ceto, sister of the Gorgons Stheno (means vigor) and Euryale (means far roaming), and sister also of the three Graeae's, Deino (means dread), Enyo (means horror) and Pemphredo (means alarm). 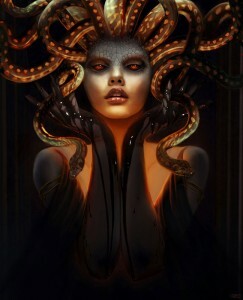 In ancient Greece, the image of Medusa was very scary throughout the mythology, but she was not always a monster. After that, Medusa became the supreme goal of many warriors, because anyone who managed to decapitate her would have an absolute advantage in the battlefield. The Medusa's severed head still had the power to petrify humans. Many men have tried to accomplish this goal with no success, except one, Perseus. 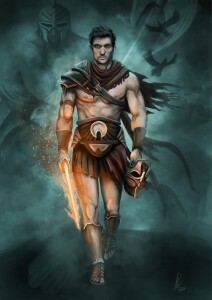 Perseus was the son of Zeus and Danae. His grandfather was Acrisius, king of Argos. Acrisius always wanted to have a son as successor to his throne. After Danae's birth, the king tried again to get a son but did not succeed. He decides to go to the Pythia oracle and learn if he will ever get a boy. Pythia announces that Acrisius will acquire a grandson from Danae and that he will be killed by him. Returning back at Argos, the king is very upset and locks Danae in a basement room to avoid the oracle's verification. Danae communicates only with her nanny and her only understanding of the outside environment is through an elevated window. Zeus was fascinated by the beauty of Danae, who decided to visit her, through the window, in the form of golden rain. From their union, Perseus was born. Acrisius learning about the birth of his grandson, because he could not kill him, he decides to shut Danae and her son in a wooden box. Then he instructs to leave the wooden box on the sea and let the gods decide about their fate. After many days of journey, the wooden box washed ashore on the shores of the island Serifos, where it is found by an angler named Dictys. Dictys, brother of the king of the island, Pollux (Polydektis), hosted at his home the two people that suffered so much and made them members of his family. Perseus grew at Serifos and became a strong lad. Pollux wanted a long time to make Danae his wife. In the beginning, he faced the objection of both Danae and his brother. Now, however, he had a major obstacle, her son, Perseus. Wanting to get rid of Perseus, he promises him that he will give him a large boat, so he can return to his homeland Argos, if Perseus achieves a glorious feat. The feat is to cut and bring back the head of Medusa. Another version of the Greek myth is that Polydektis designates marriage with Danae and asks each resident of the island for a wedding gift and specifically a horse. Perseus, being a fisherman like Dictys, had no horses. In front of the king's arrogant style, he promises that he will not bring a horse, but the head of Medusa. Polydektis accepts this commitment and decides to keep Danae into the palace until Perseus fulfils his obligation. First item is the helmet of Hades (Pluto). Wearing this helmet will make him invisible and he will safely approach Medusa. Second item is the magic bag that he will use to put inside the terrible head. Third item is the winged sandals of Hermes because the Gorgon – Medusa remained at a rock in the middle of the sea. Fourth item is the glittering shield, which would use to see the head of Medusa's reflection (because anyone who saw Medusa face to face was petrified). Last item is the sharp sword with which he would be able to cut the Gorgon's hard neck. 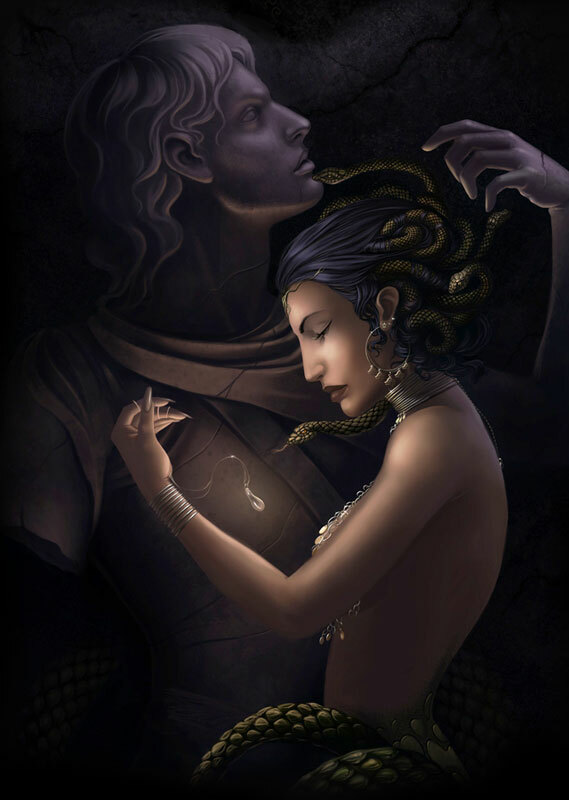 Goddess Athena particularly protected him and lent her knowledge to him on how to win the head of the Gorgon. The goddess of wisdom recommended that when he found the Gorgon, Perseus should not look at her face, but at the reflection on the shiny shield. Athena gives him the glittering shield and Hermes the winged sandals. According to another Greek myth, the helmet Cynnea of Hades, the winged sandals and the magic bag are given to him by the Nymphs, to whom Perseus arrived being guided by gods – patrons. The sharp sword that Perseus will wield to cut the Medusa's head is crafted and donated by god Hephaestus. The only thing left now is to learn the residence of the mortal Medusa – Gorgon. So once again, goddess Athena helps him, indicating the way to the three Graeae. 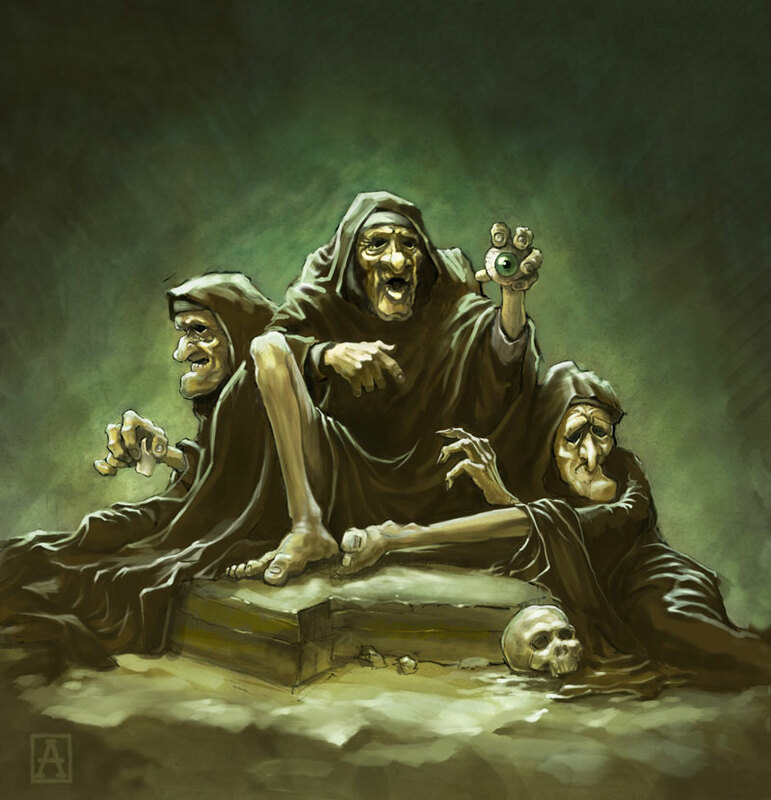 The Graeae were relatives of the Gorgon and the only ones who knew where Medusa resided. They were beings with repulsive appearance. 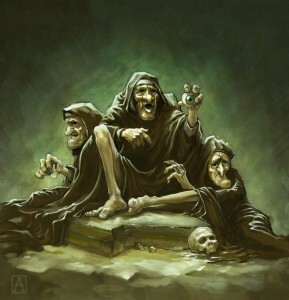 Three old women who had a tragicomic element, because they had only one eye and a tooth, they exchanged those between them. Perseus, wearing the Hade's helmet approached them invisible and taking advantage of the time of the exchange grabbed their eye. The Graeae with great difficulty and under the threat of losing their one and only eye witnessed to the hero the way to the place where Medusa was living. When Perseus approached Medusa, invisible and looking into her reflection in his shield, with Athena's help cut her head and put it in his backpack. At that time, Medusa was pregnant by the god Poseidon. From the neck of Medusa sprang the winged horse Pegasus. In the same way came Chrysaor, the hero whose name means "the one with the golden sword." To avoid being tracked by Medusa's sisters, he flew rapidly using the winged sandals. According to another version of the Greek myth, he rode on Pegasus and left Medusa's place flying into the air. Henceforth, Athena, the goddess of wisdom and war, wore the mask of the Medusa's head, the "Gorgoneion". Even after she was dead, her head maintained its ability to turn to stone anyone who looked at it. The goddess Athena then brought it over to her shield, either as a feature to infuse fear to her enemies, or attached to her chest, the sacred that protective goatskin, called "Aegis" (Aegis means protection). In the absence of Perseus, Polydektis tried to make Danae his wife using force. Her rigid stance angered him and he took her by force to the temple of Athena to sacrifice her. At that crucial moment, Perseus arrived. Polydektis, not accepting the accomplishment of the feat, provokes the hero to show him Medusa's head. Perseus warns his own people not to look and pulls out of the bag the head of Medusa. Those who looked at it, and among them Polydektis, were petrified at once. This confirmed the power of the head, even dead, and filled Serifos Island of stones that looked like people. 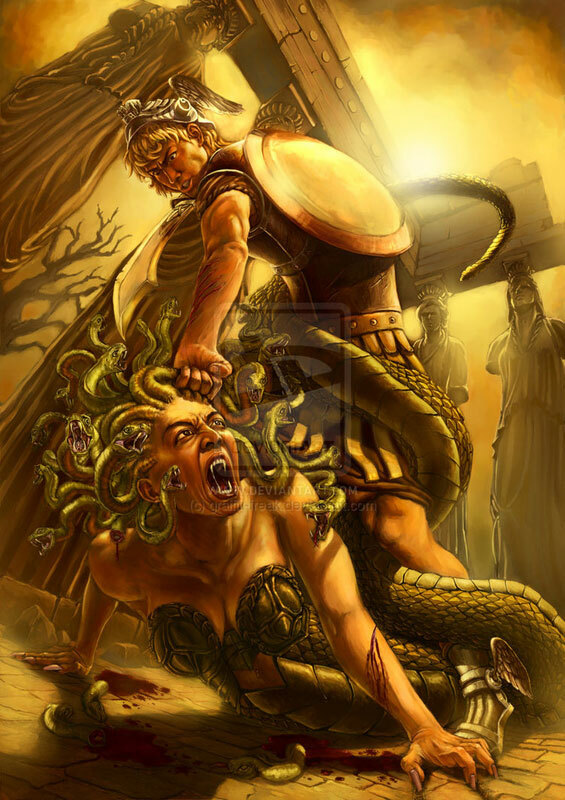 After that, Perseus dedicated Medusa's head to goddess Athena, who picked it up and pinned it in front of her shield. I am not the owner or the creator of the images and you can give credit to them, since I mention them on the image caption. I really liked the story of Medusa. Even if it was really weird, it is really good for kids doing a report on Greek mythical creatures. can you please draw me a picture of aphrodite and mail to me. This is a great website for projects and such. I’m using this for a Greek Mythology Project.I definitely get it! This is very AWESOME of you to make this. I am making a report on Hercules, Aphrodite, and Medusa. You should make more of these so I can use this website to get all the information that I need. This is extremely fascinating, the movie wasn’t illustrating much but right now, I’ve understood everything. I could definitely use it for article. Will you be making a gallery tab of all the pictures on this website? In the next months, I will re-design the whole website, make it responsive (show beautiful on tablets and on smartphones). I was just wondering as well because for a project I must site a picture and I was curious if the picture made by ironshod was made this year or last. if you could tell me that would be nice but if you can’t that is fine. Thank you for your previous response as well.